Welcome to my web site. I am a social anthropologist and scholar of religion at Uppsala University in Sweden. Previously I held the Torgny Segerstedt Guest Professorship at the University of Gothenburg. For several years I taught at Harvard University, where I was privileged to have as many as 600 students per term in my courses on civic courage and engagement. I regularly give lectures outside the university in both Swedish and English. Available for free viewing or download on UR Play. Available as a pocket paperback from these sellers. The interview can be watched on YouTube. Here is my 15-minute talk at a TEDx event in Göteborg. 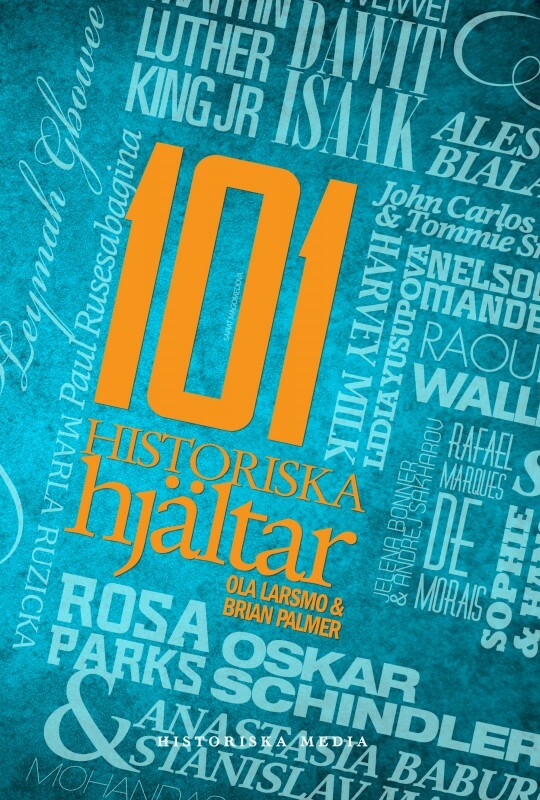 Ola Larsmo and I have written 101 portraits of heroic individuals — 101 historiska hjältar. Details at Historiska media, including sample chapters here and here and here. The book is available in hardcover and now also in softcover from bookstores and these web shops. Heartbroken to tell that according to news reports, my friend Zaida Catalán and two of her U.N. colleagues were found dead today [March 28, 2017] after having been kidnapped in DR Congo two weeks ago. Zaida and I had been friends since 2002. On several occasions, my students and I did in-class interviews with Zaida in courses about civic courage and engagement. In one such conversation last spring, I was struck by Zaida’s deep love for the people she had been endeavoring to help; she saw them as her equals and friends. The imprisoned Nobel Prize winner Liu Xiaobo wrote of the young people who were slaughtered in Tiananmen Square that they “had made the mistake of acting on impulses of sympathy or of justice.” He made the same “mistake,” and so did Zaida; both understood the risks they were taking in the service of humanity. Zaida has joined the ranks of brave humanitarians like Marla Ruzicka, Rachel Corrie, Anastasia Baburova, and Ben Linder, who all left comfortable surroundings and died young in the course of their efforts to protect others from the brutality of the world. Zaida, you reminded us that it is possible for a human being to shine so magnificently. But I wish that you had not done so; I wish that you were still with us, with me and your many other devoted friends here on this earth that is now even more brutal without you. Here is Upsala Nya Tidning’s interview with me as well as Svenska Dagbladet’s piece on the Raoul Wallenberg Calendar and Uppsala Fria Tidningen’s article on the calendar and the show. In English, there is an interview in The Local. Ordfront #2/2013 (April) has an interview with me about civic courage. Sophie Scholl left her classes to secretly distribute pamphlets against Adolf Hitler; eleven-year-old Malala Yousafzai lived amidst the Taliban while blogging about their brutality. Anthropologist Brian Palmer is haunted by such individuals who risk everything for a more humane society. He gathers wisdom from heroic lives and applies it to everyday questions of surviving as an idealist in an unforgiving world. What can our bravest contemporaries and fallen friends teach us about how to live? 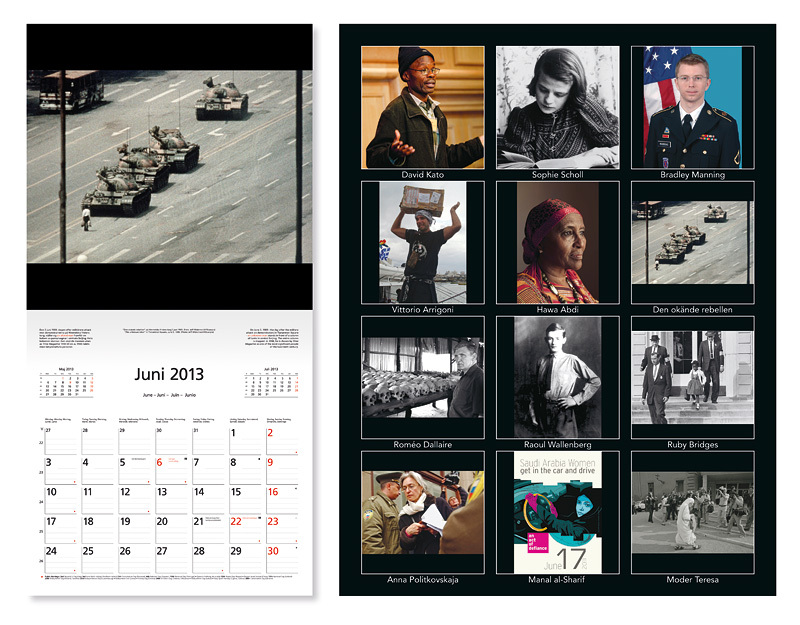 The 2013 Raoul Wallenberg Calendar — with 365 portraits of civic courage — is available in Swedish for 39 kr. There are also English and South Korean editions, and a four-language wall calendar, pictured here. Thank you to friends who contributed ideas about whom to portray in the calendar. Musician/performer Ida Lod and I have created a show about civic courage called ”Secret Conspiracy of Hope.” We use words and song to bring to life our bravest contemporaries and fallen friends, whose acts of courage touch the mystery of existence. The show weaves together stories of seven remarkable individuals (including Anastasia Baburova, Anna Politkovskaya and Maximilian Kolbe) with powerful songs — as well as reflections that draw on Simone Weil, William James, a Buddhist nun and others. The show is available in English or Swedish. It runs one hour without an intermission; shorter versions are possible. Ida Lod and I can lead discussions or workshops immediately following a performance. The first performance was at Uppsala’s Regina Theater. Here are related articles from Upsala Nya Tidning, Svenska Dagbladet, Uppsala Fria Tidningen, and The Local. The show is based on the Raoul Wallenberg Calendar (details below). The 2013 calendar describes 365 persons who have risked/given their lives or made other sacrifices for human rights, democracy, and peace. A team of colleagues and I produced it. The print edition is being distributed for free to Swedish high-school students, paid for by government monies. Three publishing houses are printing and selling an English-language edition, a South Korean edition, and an illustrated global edition in four languages. Sveriges Radio/Radioteatern will run a five-minute piece about each day’s individual during every day of 2013. See below for links to articles about the calendar. There is additional information on the websites of Forum för Levande Historia and Concess. I remember when I first started to think about people who risk their lives for others. I was a college student then, and I was reading in the New York Times about a young man who had tried to defend the rights of indigenous people in the Brazilian rain forest. Two ranchers – who wanted to take over more land – arrived in a pickup truck and shot him dead. Something about that man made me pause. Aware that others had been killed, he had kept going. I didn’t want to lose him, so I wrote down his name on a sheet of yellow paper and taped it to my wall. Soon I noticed other stories of courage: a “disappeared” democracy activist whose body was found in a ditch, a mother who had drowned while swimming out to save someone else’s child. I added their names to the sheet of yellow paper. That mystery was present one summer day in 1941 at Auschwitz, when Prisoner #16670, a Polish man named Maximilian Kolbe, saw another inmate on the way to being executed. The condemned man cried out, ”My wife! My children! Who will take care of them?” Kolbe stepped forward and volunteered to be killed in place of the other prisoner. The mystery was there, too, in the life and death of Anastasia Baburova. 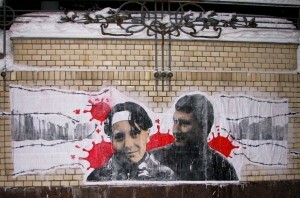 As a journalism student in Moscow, she began writing about violent extremist groups. Soon she realized that she had become their target. But she did not give up. The calendar you have in your hands tells of 365 lives of courage. Together they form a counterweight to a world of violence and greed. They remind us of what we are capable of – that amidst the dark night of indifference, it is possible for our species to shine so magnificently. A workshop for companies, government offices, NGOs and other organizations. Details are here in PDF format. Svenska Dagbladet put the Raoul Wallenberg Calendar (Wallenbergkalendern) on the cover of the culture section: http://www.svd.se/kultur/arets-alla-dagar-har-sin-egen-hjalte_7083705.svd. Here is Upsala Nya Tidning’s interview with me and Uppsala Fria Tidningen’s article about the calendar and the accompanying show. In English, there is an interview in The Local. Here is my brief comment for a news report about bystander passivity. In the past several months, my work has been profiled in Arbetaren Zenit, Ergo, Länstidningen (Östersund), Helsingborgs Dagblad, Flamman, Uppsala Demokraten and Västerbottens Folkblad, and I was interviewed on Swedish Television’s Gomorron Sverige. Många ser det hjältemodiga i att vara modig. Men det är lika viktigt att också se och begrunda det som är svårt, olämpligt eller till och med farligt med att vara modig. Kan till exempel modiga insatser vara felriktade eller till och med onda? Är det etiskt att göra uppoffringar för en främling på bekostnad av en egen familj? Är det möjligt att vara för modig och är det i vissa situationer klokare att vara feg och inte ingripa? Medverkande: Anna Hjälm, disputerad kulturgeograf med bred erfarenhet av fredsarbete i Jerusalem, Pelle Strindlund, politisk aktivist och författare och Jenny Burman som driver podcasten Slumpens hjältar. Moderator Brian Palmer. Copyright © 2015 Brian Palmer. Website redesign by Elena Kalmykova.